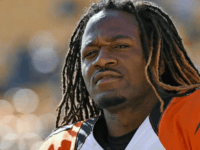 Adam “Pacman” Jones was always known for being able to supply a good quote during his playing days. Though, it appears the former Cincinnati Bengal might have saved his most colorful quote for an offseason trip to the casino. 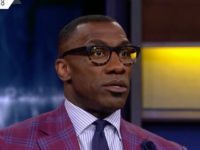 Typically, former NFL players are sympathetic to the safety concerns of current players. That is, unless the former players don’t like the current players. 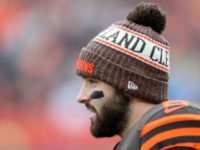 Dec. 24 (UPI) — Cleveland Browns rookie quarterback Baker Mayfield has not been shy about displaying his feelings toward former Browns head coach Hue Jackson. 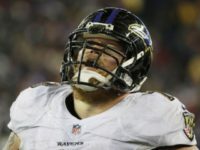 The Baltimore Ravens have officially denied that guard Marshal Yanda spat on Cincinnati Bengals linebacker Vontaze Burfict during Sunday’s game. An arbitrator has put an end to Eric Reid’s work place grievance against the Cincinnati Bengals, according to a report. It’s not unusual for fans to wear unusual things to sporting events. However, what one fan wore to the Sunday Night Football clash between the Chiefs and the Bengals, took things to another level. 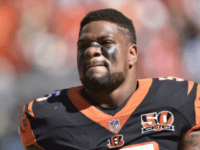 Sept. 3 (UPI) — The Cincinnati Bengals have re-signed veteran defensive end Michael Johnson. 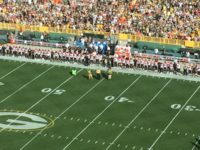 Cincinnati Bengals Owner Mike Brown recently said that NFL owners have been warned to keep quiet on the issue of player protests during the national anthem. 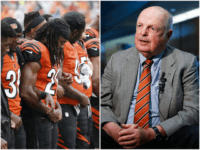 According to a report from Pro Football Talk, Bengals Owner Mike Brown told anthem-protesting free agent safety Eric Reid, that he intends to ban anthem protests on his team. 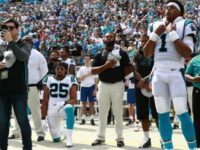 Former San Francisco 49ers safety Eric Reid finally took a meeting with the Cincinnati Bengals, but members of the sports media were unhappy that the team’s owner quizzed Reid over his two seasons of protesting during the playing of the national anthem. 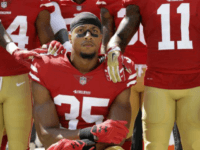 Former San Francisco 49er and national anthem protester Eric Reid, has finally been given a shot at being picked up by another team since he turned free agent after last season. 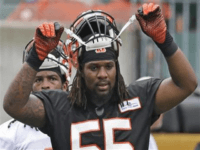 CINCINNATI (AP) — Vontaze Burfict is appealing a four-game suspension from the NFL for violating its policy on performance-enhancing substances, the third straight season that the Cincinnati Bengals linebacker is facing punishment from the league. 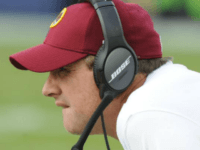 Dec. 24 (UPI) — The Gruden football family could again coach two of the NFL’s 32 teams, according to sources. 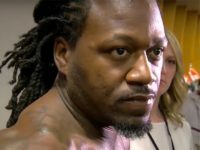 Because nothing exemplifies the Steelers-Bengals rivalry quite like a kick in the face, Bengals linebacker Vontaze Burfict has provided us with just that. 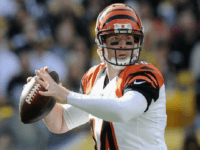 The Bengals entered Week 3 of the NFL season, having not scored an offensive touchdown. 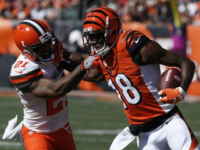 However, amidst a sea of protest across the league on Sunday, the Bengals scored in another way, a way that will leave a lot of their fans happy. 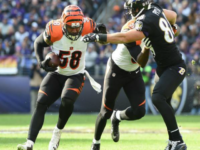 Sept. 12 (UPI) — Cincinnati Bengals linebacker Vontaze Burfict was retweeting plays from the Pittsburgh Steelers game Sunday while his team was playing. Deshaun Watson has started the second half at quarterback for the Houston Texans after a terrible first half by Tom Savage. The Texans traded up to draft Watson in the first round, but insisting all offseason that Savage would start. 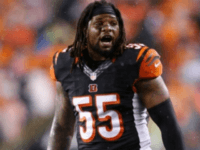 CINCINNATI (AP) — Bengals linebacker Vontaze Burfict had his NFL suspension reduced from five to three games Wednesday for his egregious hit on a Chiefs running back. 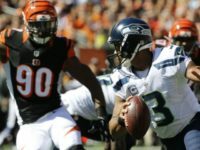 Coach Marvin Lewis defended the hit by Vontaze Burfict that caused the NFL to suspend him for five games and insisted that the Bengals linebacker has changed his ways on the field to conform to the league’s emphasis on player safety. Aug. 19 (UPI) — The Miami Dolphins have signed linebacker Rey Maualuga, according to sources. 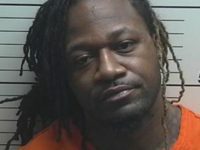 NFL Network reported the deal for the linebacker on Saturday afternoon. 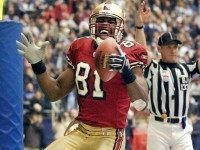 Wide receiver A.J. Green has been to the Pro Bowl in all six of his NFL seasons. He recently told the team website he wants to play seven more years. So, it turns out selecting the most toxic player in the NFL Draft was not such a great idea. 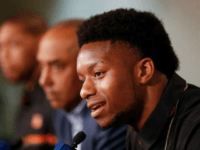 This realization might have already begun to crystalize in the upper reaches of the Bengals organization, since it appears their decision to draft woman-beating running back Joe Mixon has sparked a hometown media revolt. 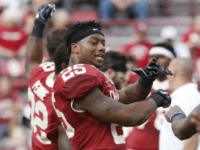 Oklahoma running back Joe Mixon is headed to Cincinnati, which added to its reputation for taking chances on players with off-field problems. 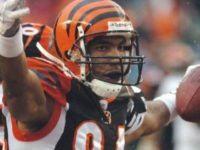 One of football’s most troubled players is on the sidelines and without a team, but despite his troubled history former Bengals wide receiver Terrell Williams should qualify for induction into the Hall of Fame. In fact, one player says that the Hall of Fame should be shut down if Owens doesn’t make it in. CINCINNATI, Dec. 24 (UPI) — Optimism surrounded A.J. Green’s status before the Cincinnati Bengals eventually pulled the plug on the perennial Pro Bowl selection.